This stage was supposed to be an easy one. Afterwards it was more difficult than we thought. This stage I walked together with Huib, Solenne, Marcelo and Cess. My stamina was now on proof. We walked a nice pace and decided to walk 1 village further then Zurbiri, Larrasoana. Afterwards this was not a wise decision. In this little village there were no sleepingplaces for us. The result was that 7 pilgrims (2 Dutch, 1 German, 3 French and 1 Ecuadorian) had to sleep outside. We decided that we would ask a local if we could sleep in his garden. Marcelo was choosen to speak because his mothertongue is Spanish. He spoke minimum 20 minutes to the owner that we will not make a mess and if we can please sleep in the garden. Fortunately he agreed and we could sleep in his garden. Huib was so kind to put down the tent on the ground so we could sleep on this in stead of the ground. Everyone had a sleepingbag except…. me ofcourse. I forgot mine and… the 2nd day of the camino it was really necessary to have one. It started to become cold in the mountains. I put all clothes on which I brought with me and I used my towel to soften a little bit the hard ground. I used my backpack as a pillow. Solenne said she was a little bit afraid. I proposed she lay between Huib and me. This gave her a safe feeling. Immediately your man instinct is activated to give a woman a safe feeling. 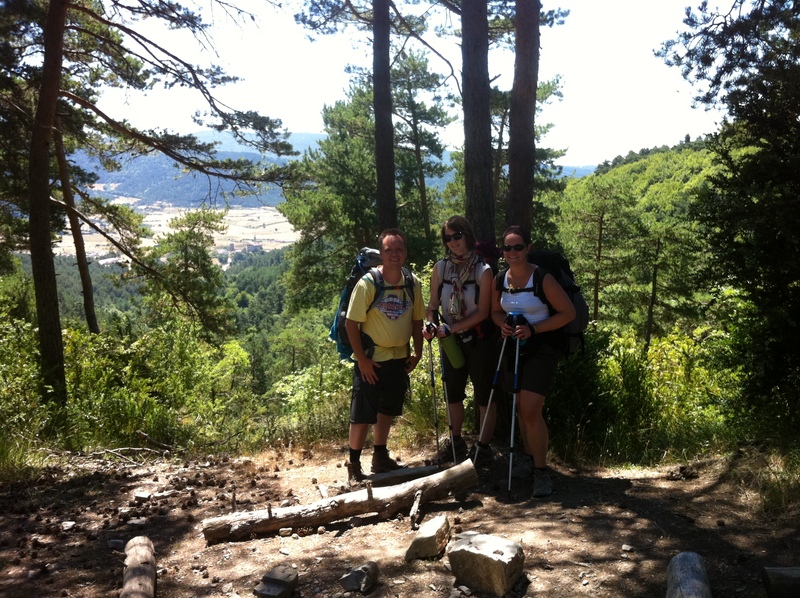 Before we went to sleep we did a round why we are walking the camino and why we are grateful. I wake up during the night. Ofcourse because of the cold. I looked on my phone and saw the time : 4.02am. I thought what is this freaking cold… not nice. I opened my eyes well and saw… a lot of clouds with in the middle a hole… with inside the most beautiful view you can imagine. A clean heaven with the milkyway with all colors you can imagine. Incredible beautiful. I was touched by the prettiness and it had a special meaning for me. UPDATE: Mystery solved: Fallstreak hole during my camino. We all woke up soon and decided to start walking. We couldn’t get the german guy awake… he was sleeping in a sleepingbag which he connected between 2 trees… Breakfast was also not possible her. That could be in the next village and maybe even in the next one because it’s now so early. If you have that less sleep and you know you have to walk much you become a little demotivated. Tired and broken and still having to start such a big walking trip. The beauty of all this is that when you start walking you forget all the bad things. It was a tough night but it was also one of the most beautiful I had ever experienced. No sleepingplaces… so we slept outside!